Hi friends! Anyone here needing to take better care of their skin? Am I the only one? 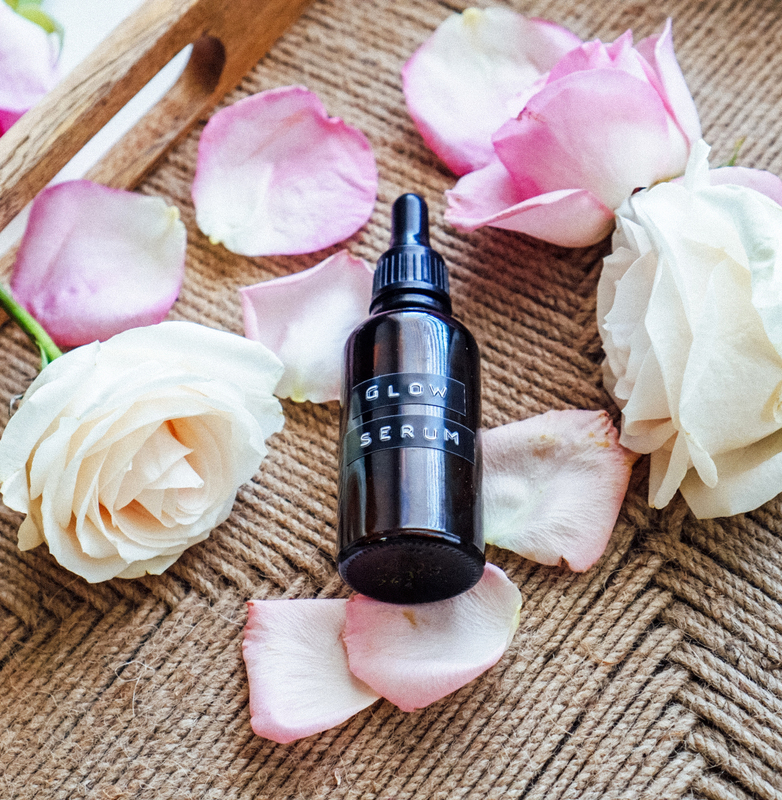 Then look no further than my DIY essential oil glow serum. 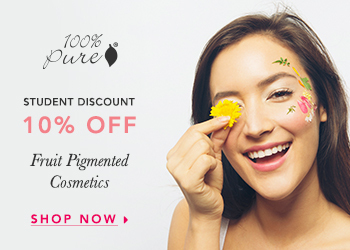 It’s perfect for all skin types – from oily, to dry, to normal skin! I’m about to turn 33 next month- eek! A few months ago, I began to notice that my skin was lacking in all areas that mattered: pore size, elasticity, radiance, and clarity. 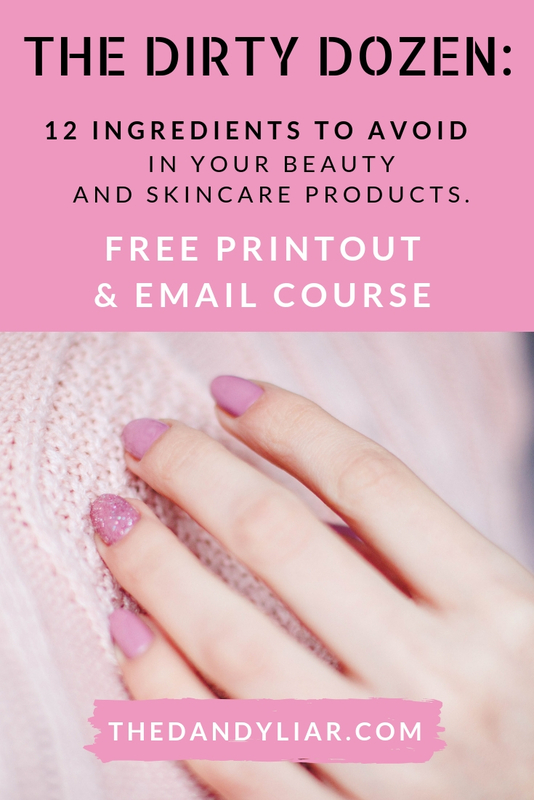 So, I decided to take a closer look at my skincare regimen; I noticed that 99.9% of the products I was using (that weren’t even working) contained a lot of harmful, toxic ingredients. Many claimed to do certain things… and didn’t. Some were also labelled as safe, clean, paraben-free, or my favorite, “all-natural” but were in fact quite the opposite. After a lot of searching for “clean” products out on the market, I realized the answer was staring at me in the face straight from my oil shelf. Why not use essential oils to make my own skincare product? 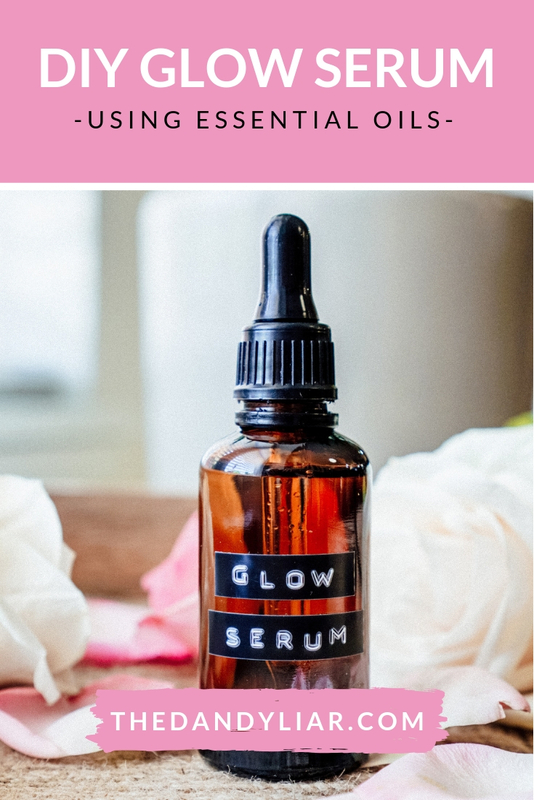 And that’s when I decided to make my own DIY essential oil glow serum from the very ingredients that have improved every other aspect of my life- from sleep to emotions to overall health! 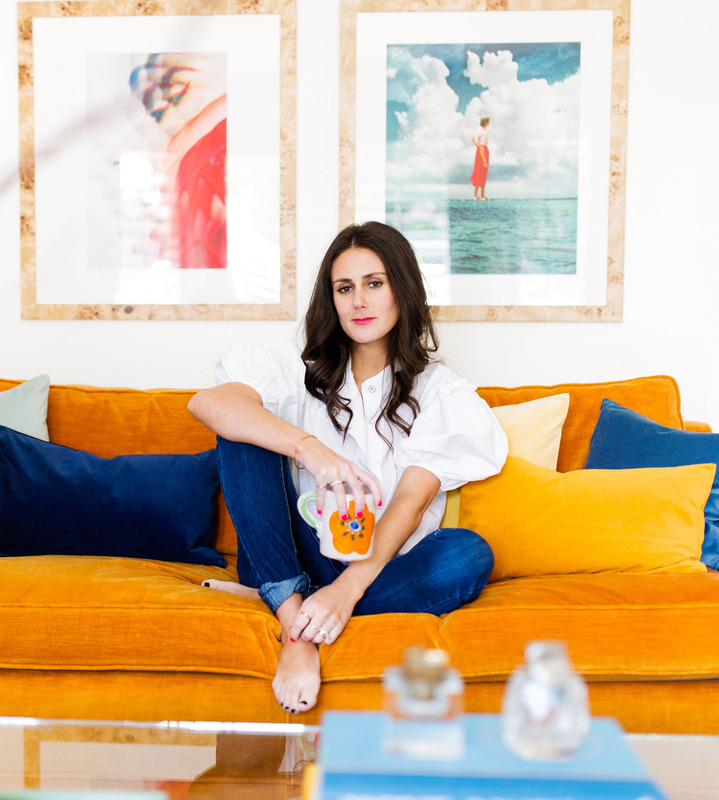 To read about why I started using essential oils in the first place and which ones I use, you can head over to this post. 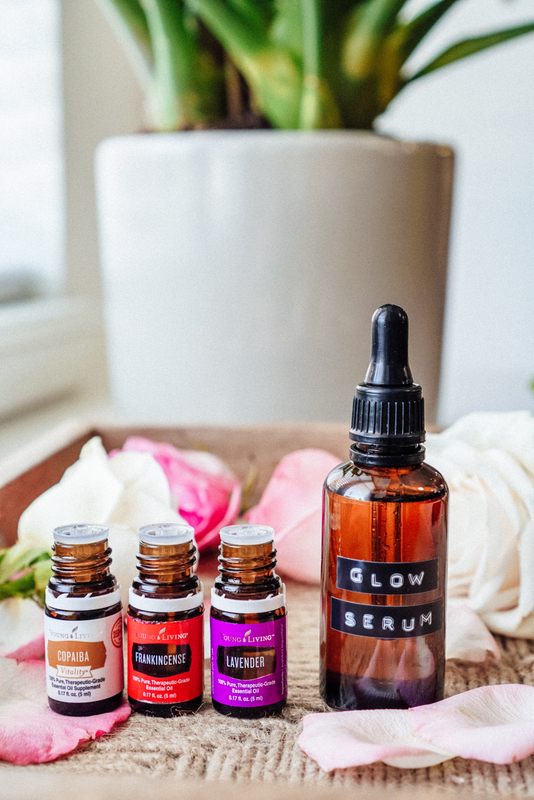 The DIY essential oil glow serum contains Copaiba, Frankincense and Lavender essential oils, which when used in combination with each other, create a trifecta of skincare goodness. They moisturize your skin, help promote circulation, minimize pores, reduce inflammation, and help to heal and treat open cuts and wounds (I see you, pimple!). And? They do all of this naturally and non-toxically. I can’t say that for most of the ingredients in the other skincare products I used to use (SMH). The serum uses Jojoba oil as its base, which has many amazing properties for your skin. It closely mimics the skin’s natural sebum, making it a great oil for normal, dry and oily skin types. This also means that it’s less likely to clog pores than any other type of oil. Jojoba oil is anti-bacterial, which means it helps fight the bacteria that causes breakouts. Lastly, acts as a protective barrier to prevent your skin from losing moisture. Pour in your 10 drops of each oil into the empty glass dropper bottle. Fill the rest with carrier oil. Stir the mixture with the glass dropper, then add the lid onto the bottle. Then? You’re done! So easy, right? 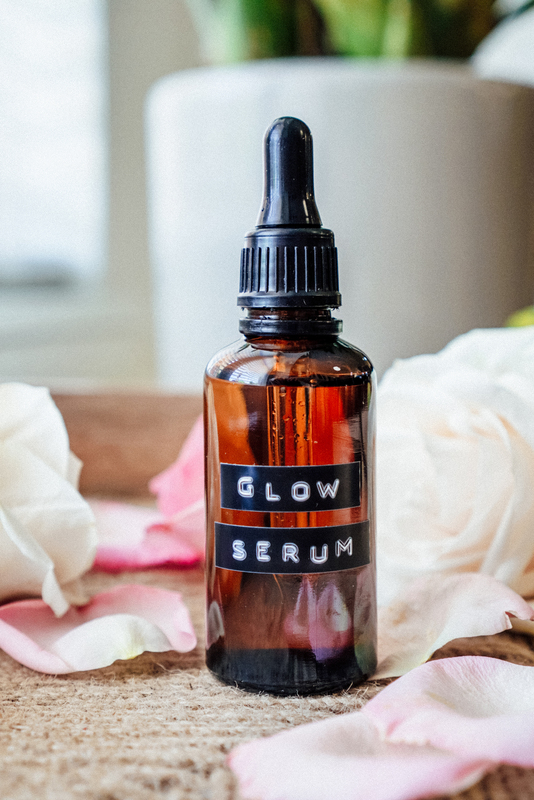 I’ve even incorporated my DIY essential oil glow serum into both my morning and evening skincare regimens. In the morning, I wash my face with water, followed by a few dabs of the Glow serum before applying my moisturizer and makeup for the day! Then, at night, I wash my face, followed by my DIY facial toner with apple cider vinegar. Then, I lather on the glow serum… under my eyes, on my forehead, and alllll around my face and neck! I also apply it on top of my makeup to add a bit of shimmer (on my cheek and brow bones).